Large raceways are deeply embossed for extra strength and bearing surface. Special precision kingpin engineered for thrust absorption and durability to withstand loads of rated capacity. 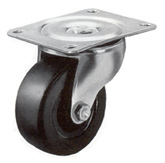 Medium-Duty swivel casters with or without directional locks and total locks for food service, health care and hospital equipment, utility carts, and portable equipment. Directional locks are available in one or two position. Total lock simultaneously locks the swivel and wheel making the unit stationary. Easy "step-on - step-off" toe mechanisms. 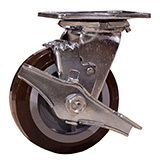 Grease Fittings: Provided in swivel raceway and wheel bearings Fork Leg Spacing: 2 1/2"